Sorcerer's Wand - LEVITATION BL23 Generally this wand is made of Indian Walnut but sometimes due to the unavailability of Indian Walnut - Mahagony wood is used. Both of these worldclass woods are of supreme quality & durability. 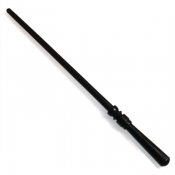 The length of this wand is approximately 14 inches. Sorcerer's Wand - WITCH BL31 Generally this wand is made of Indian Walnut but sometimes due to the unavailability of Indian Walnut - Mahagony wood is used. Both of these worldclass woods are of supreme quality & durability. The length of this wand is approximately 14 inches. Sorcerer's Wand - POWER BL9 Generally this wand is made of Indian Walnut but sometimes due to the unavailability of Indian Walnut - Mahagony wood is used. Both of these worldclass woods are of supreme quality & durability. The length of this wand is approximately 15 inches. Sorcerer's Wand - WHITE MAGIC BL17 Generally this wand is made of Indian Walnut but sometimes due to the unavailability of Indian Walnut - Mahagony wood is used. Both of these worldclass woods are of supreme quality & durability. The length of this wand is approximately 14 inches. Sorcerer's Wand - SAME NAME ELDER OR PRONGS BL3 Generally this wand is made of Indian Walnut but sometimes due to the unavailability of Indian Walnut - Mahagony wood is used. Both of these worldclass woods are of supreme quality & durability. The length of this wand is approximately 14 inches. 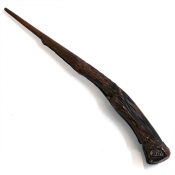 Sorcerer's Wand - DARK SPELL BL33 Generally this wand is made of Indian Walnut but sometimes due to the unavailability of Indian Walnut - Mahagony wood is used. Both of these worldclass woods are of supreme quality & durability. The length of this wand is approximately 13 inches. Sorcerer's Wand - DARK BL15 Generally this wand is made of Indian Walnut but sometimes due to the unavailability of Indian Walnut - Mahagony wood is used. Both of these worldclass woods are of supreme quality & durability. The length of this wand is approximately 15 inches. Sorcerer's Wand - SAME NAME ELDER BL21 Generally this wand is made of Indian Walnut but sometimes due to the unavailability of Indian Walnut - Mahagony wood is used. Both of these worldclass woods are of supreme quality & durability. The length of this wand is approximately 14 inches. Sorcerer's Wand - SORCERER BL4 Generally this wand is made of Indian Walnut but sometimes due to the unavailability of Indian Walnut - Mahagony wood is used. Both of these worldclass woods are of supreme quality & durability. The length of this wand is approximately 14 inches. Sorcerer's Wand - GOBLIN BL8 Generally this wand is made of Indian Walnut but sometimes due to the unavailability of Indian Walnut - Mahagony wood is used. Both of these worldclass woods are of supreme quality & durability. The length of this wand is approximately 13.5 inches. Sorcerer's Wand - LIGHT BL6 Generally this wand is made of Indian Walnut but sometimes due to the unavailability of Indian Walnut - Mahagony wood is used. Both of these worldclass woods are of supreme quality & durability. The length of this wand is approximately 14 inches. Sorcerer's Wand - STUDENT BL5 Generally this wand is made of Indian Walnut but sometimes due to the unavailability of Indian Walnut - Mahagony wood is used. Both of these worldclass woods are of supreme quality & durability. The length of this wand is approximately 15 inches. Sorcerer's Wand - ELDER BL1 Generally this wand is made of Indian Walnut but sometimes due to the unavailability of Indian Walnut - Mahagony wood is used. Both of these worldclass woods are of supreme quality & durability. 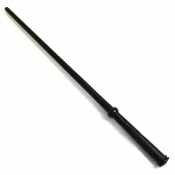 The length of this wand is approximately 14 inches.